The Ranch Resort Banquet and Conference Centre in Bethany welcomed the drivers, teams, staff and officials of Canada’s Toughest 3rd of a Mile Paved Oval as Peterborough Speedway celebrated its 2014 season Saturday, November 22nd. Track owner/promoter J.P. Josiasse welcomed everyone to the evening’s festivities with the annual ‘State of the Speedway’ address, acknowledging the contributions of corporate and divisional sponsors, as well as track personnel as Peterborough Speedway continues to grow the motorsports brand that started in a farm field over 48 years ago and make history for generations to come. After beginning his career with a Thunder Car a number of years ago, 2014 was a banner season for Ryan Kimball. He not only claimed the Earl Ireland Auto Sales Late Model division track championship, he also added an Autumn Colours Classic title to his impressive racing resume. Matt Spence took the Late Model Rookie of the Year Honours. Tyler Betts claimed the Most Improved Driver award. The Late Model Most Sportsmanlike driver – in memory of Terry Calvert – was Matt Spence, while Kimball’s #73 was named the Best Appearing Car. No stranger to the tight confines of Peterborough Speedway as an endurance racer, Anthony DiBello came out charging from the year’s first Paul Davis Systems Thunder Car green flag and even though he entered the final night of racing trailing in the points, the driver of the #16 emerged with the 2014 track championship. Fedele DiBello captured the Rookie of the Year prize for the Thunder Car field. Brad Lavalle won the Most Improved Driver honours. Dan Price was named the Most Sportsmanlike Driver. The Best Appearing Thunder Car was the #40 shared between Donny Beatty and Stu Robinson Jr. The #15 of Rob Richards was presented with the Paul Davis Systems Thunder Car Hard Charger award. An early season hot streak set the standard everyone else in the Parry Spring Service Renegade Truck division would chase for the entire year, but no one could match the performance of the potent #07 as Jack Dallin clinched the 2014 crown. Jeff Vanderbelt was named top first year runner in the Renegade Truck class. Josh Milwain took the Most Improved Driver hardware. The Most Sportsmanlike Driver was Stephen Bierworth, with Bill O’Hara’s #6 taking the Best Appearing Truck honours. Part of the multi-car Farm Bro team, Ryan Babin celebrated his second season in the Peterborough Hyundai Mini Stock division with some strong runs and although he was tied for the title entering the final night of action, the driver of the #89 had earned the top spot at the checkered flag. James Townsend was named Mini Stock Rookie of the Year. Henk Mulders captured the Most Improved Driver award. Danny Benedict was named the Most Sportsmanlike driver, while Ryan Oosterholt’s #79 was tabbed as the Best Appearing Car. Her first ever start came in the 2012 running of Autumn Colours and just 2 years later, her strong runs and dedication paid off. Capturing the Battlefield Equipment Rental 4Fun track championship a month before her 15th birthday was the #62 of Willow Barberstock. The Rookie of the Year in the 4Fun division was shared by drivers of the #9 car, Sean Kennedy and Cody Fenton. Jeremy Kelly was named Most Improved Driver. Marilyn Junkin took the Most Sportsmanlike Driver award and Ray Schroer’s #50 was picked as Best Appearing Car. The endurance races are always crowd pleasers and this year’s events were no exception. Taking the overall title in the 8 cylinder class for the second straight year is Shane Richards. Steve Lavoi and Mitch Klompmaker rounded-out the top 3. His family is synonymous with endurance racing at Peterborough Speedway. Always finishing at or near the front of the pack in the 4/6 cylinder division is this year’s champion, Cameron Pedersen. Noel Snow and Tyler Junkin finished 2nd and 3rd in points. Earl Ireland Auto Sales Late Model: 1). Ryan Kimball, 780. 2). Adam Cuthbertson, 701. 3). Jack Horner, 687. 4). Craig Perry, 677. 5). Matt Spence, 661. Paul Davis Systems Thunder Car: 1). Anthony DiBello, 839. 2). Howie Crowe, 838. 3). Donny Beatty, 802. 4). Dan Price, 720. 5). Brad Lavalle, 693. Parry Spring Service Renegade Truck: 1). Jack Dallin, 864. 2). Bill O’Hara, 841. 3). Jeff Vanderbelt, 826. 4). Stephen Bierworth, 676. 5). Josh Milwain, 613. Peterborough Hyundai Mini Stock: 1). Ryan Babin, 765. 2). James Townsend, 743. 3). Tyler Junkin, 731. 4). Kevin Strutt, 679. 5). Ryan Oosterholt, 677. Battlefield Equipment Rental 4Fun: 1). Willow Barberstock, 824. 2). Ray Schroer, 799. 3). Matthew Vanderbelt, 796. 4). Marilyn Junkin, 738. 5). Sean Kennedy, 709. Bullring bullet points: Peterborough Speedway’s 2015 drivers meeting will be held Sunday, December 7th at the Best Western Otonabee Inn on Landsdowne Street East. There will also be a meeting Sunday, November 30th to discuss plans for the new Pro Late Model tour scheduled for 2015. 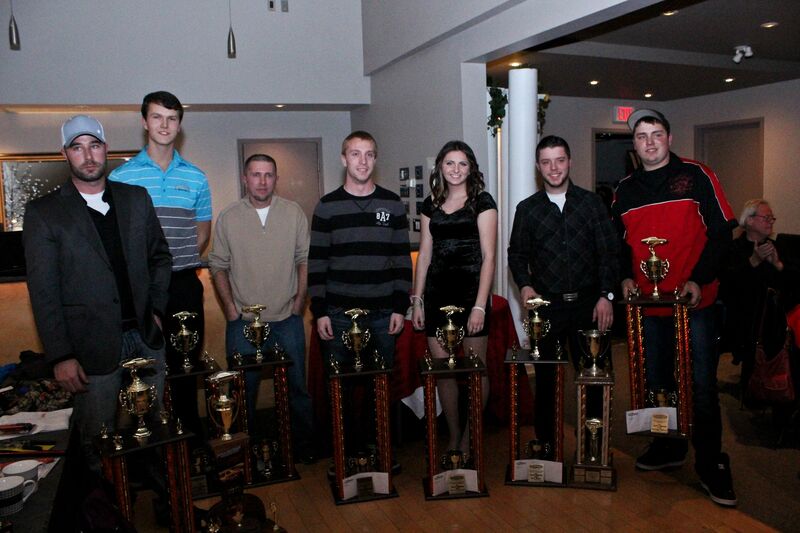 Peterborough Speedway’s 2014 track champions (L-R) Ryan Kimball, Cameron Pedersen, Shane Richards, Jack Dallin, Willow Barberstock, Ryan Babin and Anthony DiBello pose with their hardware.